Below you fill find all funeral homes and cemeteries in or near Scottsville. Suburbs of Scottsville: Gainesville, Halfway, Halifax, Trammel. 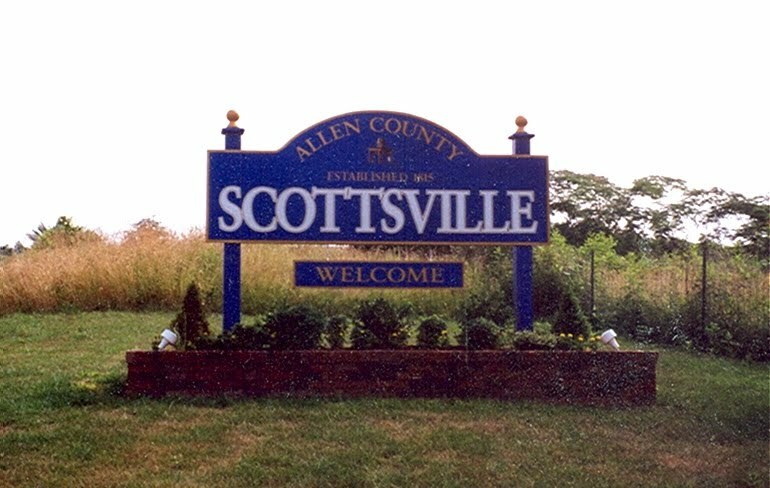 Scottsville is also known as: Allen County / Scottsville city. Zip codes in the city: 42164. Some of the notable people born here have been: (asher g. caruth), (jim mcdaniels), (harry pulliam), and (odie spears). Scottsville is a home rule-class city in Allen County, Kentucky, in the United States. It is the seat of its county. The population was 4,226 during the 2010 U.S. Census. It was reported by Cincinnati Enquirer and Cincinnati Post on August 1st, 2018 that Aaron Duncan "Toby" Stark passed away in Cincinnati, Ohio. Stark was 76 years old and was born in Scottsville, KY. Send flowers to express your sorrow and honor Aaron Duncan "Toby"'s life. It was revealed on October 18th, 2017 that Joy Ray Gullett (Gordon) perished in Scottsville, Kentucky. Ms. Gullett was 80 years old. Send flowers to share your condolences and honor Joy Ray's life. It was reported by The News Tribune on August 31st, 2016 that Charles Edward Mandrell died in Washington. Mandrell was 88 years old and was born in Scottsville, KY. Send flowers to express your sorrow and honor Charles Edward's life. It was reported on August 8th, 2015 that Norma Roland Kerns passed away in Scottsville, Kentucky. Kerns was 72 years old. Send flowers to express your sympathy and honor Norma Roland's life. It was revealed by The Desert Sun on October 31st, 2013 that Earline Shields (Frost) perished in Palm Springs, California. Ms. Shields was 94 years old and was born in Scottsville, KY. Send flowers to express your sorrow and honor Earline's life. It was disclosed by Glasgow Daily Times on April 17th, 2013 that Allen Capps perished in Scottsville, Kentucky. Capps was 81 years old. Send flowers to express your sympathy and honor Allen's life. It was noted by Franklin Favorite on April 13th, 2013 that Ricky Allen Gillock passed away in Scottsville, Kentucky. Gillock was 53 years old. Send flowers to share your condolences and honor Ricky Allen's life. It was written by Franklin Favorite on April 13th, 2013 that Ray Hagan died in Scottsville, Kentucky. Hagan was 88 years old. Send flowers to express your sorrow and honor Ray's life. It was revealed by Franklin Favorite on April 13th, 2013 that Halious Harold Isbell passed away in Scottsville, Kentucky. Isbell was 72 years old. Send flowers to express your sympathy and honor Halious Harold's life. It was written by Paducah Sun on February 14th, 2013 that Jennifer Tinsley passed away in Scottsville, Kentucky. Tinsley was 47 years old. Send flowers to express your sorrow and honor Jennifer's life. The population was 4,327 at the 2000 United States Census census. Scottsville is a city in and the county seat of Allen County, Kentucky County, Kentucky, United States. . . . The official website for the city of Scottsville is http://www.scottsvilleky.org. William Bishop of Martinton, Vernon Bell of Goreville, Jimmy Bell of Martinton; one sister, Earlene Sircy of Scottsville, Ky.; one granddaughter ... He was an Army veteran. Funeral services 8 p.m. Wednesday at Robison Chapel in Catlin. Serving Scottsville and Allen County Kentucky areas. Professional, Experienced. Call today. Full service funeral home serving Scottsville and Allen County Kentucky areas. Call today. Listing all funeral homes in Scottsville, Kentucky so you can easily send flowers to any location (same day delivery) or find any funeral service. Find a Funeral Home inScottsville, Kentucky KY to provide the caring burial and ceremonial services your family deserves. We work with local florists and flower shops to offer same day delivery. You will find budget sympathy flowers in Scottsville here. Our funeral flowers are cheap in price but not in value.